Today marked a milestone in my life as it was the first of very few Tuesdays that I didn’t go to work at a job I have had for almost eleven years. This decision was by choice as I recently stepped down from this position and the transition stage has ended. The job I held was great and I am so very grateful for the opportunity I had to work in the position. It came at a time that was absolutely perfect. A time where we needed income and I wasn’t even sure how it would come. I worked for my friend in her home office and gained so much by having this position. It was a bittersweet end to a wonderful time in my life. However, peace is what I felt this morning when I woke up and knew the day was mine to navigate. Not that my last job was bad, because it wasn’t, but today I had say into what my day would hold. 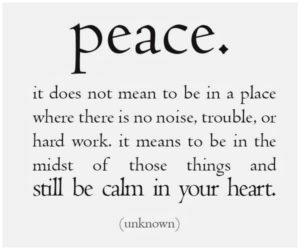 The peace I am feeling is a mixture of freedom for having a big responsibility off my plate, but also the availability to move on to new and exciting things. Things God has led me toward. I have longed to do different things with my life and have come to this new opportunity by God’s design that I never would have dreamed it could be. It gives me an amazing amount of peace knowing that God has got this all planned and He knows the path of my future. He provides the peace I need that will help me pursue my passion and recognize my potential. Peace I have with you; my peace I give you. I do not give to you as the world gives. Let us therefore make every effort to do what leads to peace and mutual edification. Take some time today to write down the peace you long for. 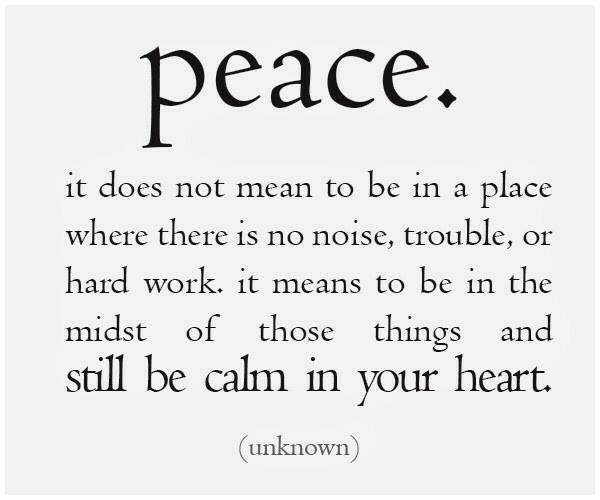 What action steps can you make today to move toward that peace? You have got what it takes, trust me you do.